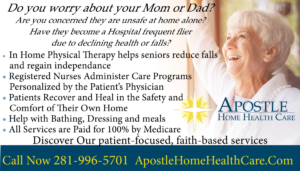 Kathy and Doug own and operate Apostle Home Health Care, a faith based Home Health Care Agency with offices in Friendswood, Texas. One of the key lessons Kathy learned in her twenty years of Nursing care for geriatric patients is that it was not enough to just tend to the needs of the body. Kathy recognized that taking a holistic approach, where the patient’s body and spirit are both tended to by attentive and caring staff, results in better patient health and vitality. To bring Kathy’s holistic care vision to life, she founded Apostle Home Health Care in 2004. Their patients thrive in the home environment and continue to live longer, healthier, and happier lives, with minimal assistance. Many times in their daily work they have heard from the community “if we had only known about” a program, a resource, an organization, “then my Mom / Dad / sister, aunt would be here today”. Too many tragic endings caused by a simple lack of information. To bridge that information gap and as an extension of their community outreach Kathy and Doug are producing The Senior Answer to provide helpful information to the senior community and their caregivers.